Get a Matt Sharp Midwest Ghosteez! While female musicians are represented a fair amount in Redefine’s reviews and interviews, I have noticed, over time, that the majority of bands and musicians we cover are in fact male. The number of female rock musicians has certainly increased through the years, but the industry is still largely male-dominated. Girls Rock! takes a look at this issue by documenting an annual all-girls rock n’ roll in Portland. With over 60 volunteer counselors and staff, including well-known musicians like Carrie Brownstein from Sleater-Kinney and Beth Ditto from The Gossip, the camp helps young girls aged 8 to 18 build confidence in their songwriting skills, in their instrumental skills, and most importantly, in themselves. Girls are split up into groups according to the type of music they want to write, and then form their own bands. They work for multiple days with their bands to create songs, which they ultimately perform at a concert at the end of the camp. The skills of the girls vary from those who are very acquainted with instruments to those who have never picked up an instrument in their lives. In the documentary, the filmmakers choose to follow five different girls closely. They vary in age, but all of them are afflicted with some sort of problem – be it related to anxiety, health, or rough pasts — that makes it difficult for them to truly pursue music or to believe in themselves. Girls Rock! shifts back and forth between clean-cut camp fun, camp drama, historical facts, and punk-inspired intermissions that deal with many of the issues which plague young women today, including, but not limited to, body image, lack of confidence, and sexism. While the documentary holds strongly to feminist ideals, it never becomes overly preachy, simply because it relies on testimonials from real girls. The film is an honest look into the lives of young women undergoing transition, with stories which are sometimes heart-breaking and sometimes heart-warming. 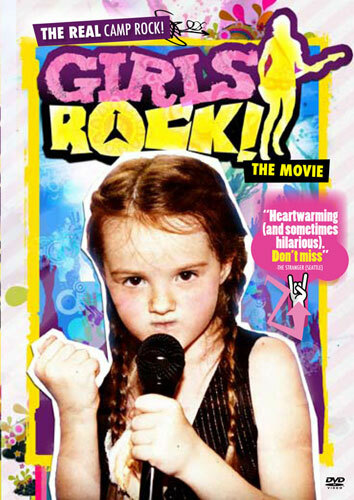 The DVD itself has a lot to offer as well, including follow-ups with the girls who were featured in the movie. All of them spoke highly of their experience in camp, and all of them attested to the fact that camp helped them become more comfortable with themselves. Also included in the Special Features are interviews with members of Sleater-Kinney, Bikini Kill, and The Gossip, as well as tutorials in all things DIY, from self-defense to zines.